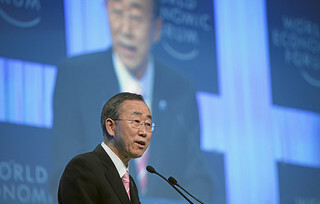 DOHA, Apr 19 2012 (IPS) - U.N. Secretary-General Ban Ki-moon the has called for a U.N. observer mission in Syria to be expanded, even though he says Damascus has failed to adhere to a ceasefire central to an agreed peace plan. In a report to the U.N. Security Council on Wednesday, Ban called for 300 unarmed observers to be sent on a three-month mission, and also said it was “critical” for Syrian President Bashar al-Assad to meet his commitments. The council called for Ban to report back when it passed a resolution on Saturday which sent an advanced party of 30 unarmed military observers to Syria. His report, obtained by the AFP news agency, said that even though Syrian troops have not withdrawn from cities and violence has escalated since the ceasefire began, “an opportunity for progress may now exist, on which we need to build”. The 300 observers would deploy over several weeks and go to about 10 different parts of Syria to monitor the fragile cessation of hostilities which officially started on Apr. 12. They would also monitor the implementation of U.N.-Arab League envoy Kofi Annan’s six-point peace plan, which Syrian authorities have agreed to support. The report will be discussed by the Security Council on Thursday and diplomats said a resolution allowing the full observer mission could be ready by early next week if there is agreement among the 15 members. Meanwhile, a Syrian activist group says clashes between troops and army defectors in an eastern city have left at least one person dead. The Britain-based Syrian Observatory for Human Rights says Thursday’s clashes in Deir el-Zour also wounded three civilians. Activists say Syrian troops also shelled rebel-held areas in the central city of Homs and the nearby town of al-Qusair, which borders Lebanon. The observatory says intense shooting and explosions could be heard in Homs’ al-Qarabis and Jurat al-Shayah neighbourhoods. The U.N. says well over 9,000 people have been killed in Syria since an uprising against Assad broke out in March 2011. Activists says scores have died since the ceasefire started. Ban said that violence “dropped markedly” when the ceasefire began, but Syria “has yet to fully implement its initial obligations regarding the actions and deployments of its troops and heavy weapons, or to return them to barracks. “Violent incidents and reports of casualties have escalated again in recent days, with reports of shelling of civilian areas and abuses by government forces,” he said. Ban said only “partial” action has been taken on other parts of the Annan plan. “While difficult to assess, it does not amount yet to the clear signal expected from the Syrian authorities,” he said. At the moment there are six observers in Syria, led by a Moroccan colonel. The full mission would be led by an officer of at least the rank of major general. Ban said the team has so far been refused permission to go to Homs, with Syrian officials claiming “security concerns”. The mission went to Deraa, the revolt’s epicentre, on Tuesday, where “it enjoyed freedom of movement” and “observed no armed violence or heavy weapons”. But Ban confirmed violent incidents when the U.N. observers went to Arbeen, in the Damascus suburbs, on Wednesday. “A crowd that was part of an opposition demonstration forced United Nations vehicles to a checkpoint. Subsequently, the crowd was dispersed by firing projectiles,” said the report. One U.N. vehicle was slightly damaged, but no injuries were observed by the team. Ban said the new mission, to be known as the U.N. Supervision Mission in Syria (UNSMIS), would include political, human rights, civil affairs, public information, public security, gender and other advisers. However, it would not carry out humanitarian assistance duties.